Robots are learning new tricks all the time and for every trick they learn they become more useful. These tricks are especially useful when you’re talking about disaster response. The disaster response team of the future is going to be all robot. And what that robot is capable of could determine your life or death. Honda has unveiled a working prototype of its E2-DR disaster response robot and it is very capable already. It stands 1.68 meters high and weighs 85 kilograms. E2-DR can walk, navigate over objects, climb stairs and ladders, get through narrow spaces and traverse piles of debris like a bot on a mission, which it is. This robot can even stand being in the rain for 20 minutes. To keep it as lightweight as possible, Honda exchanged traditional cables for optical fibers. It also has a 1000-Wh lithium-ion battery that delivers 90 minutes of power, an Intel Core-i7 CPU, and air ducts and internal fans in the torso to keep it cool. The hands have cameras and 3D sensors, but can only do basic gripping. It won’t belong before we are sending robots in to rescue people after a disaster. 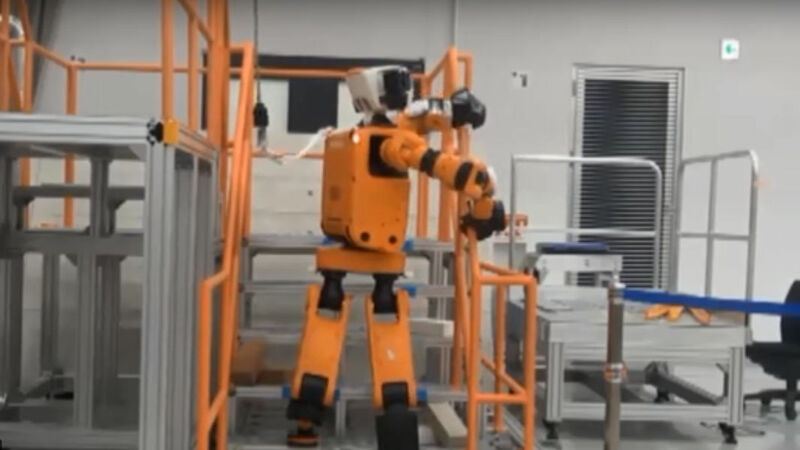 It is amazing watching this robot climb ladders and stairs. You may owe your life to a robot one day.